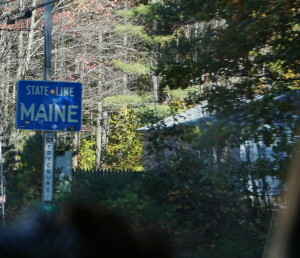 Maine | Retired and Lovin' it. 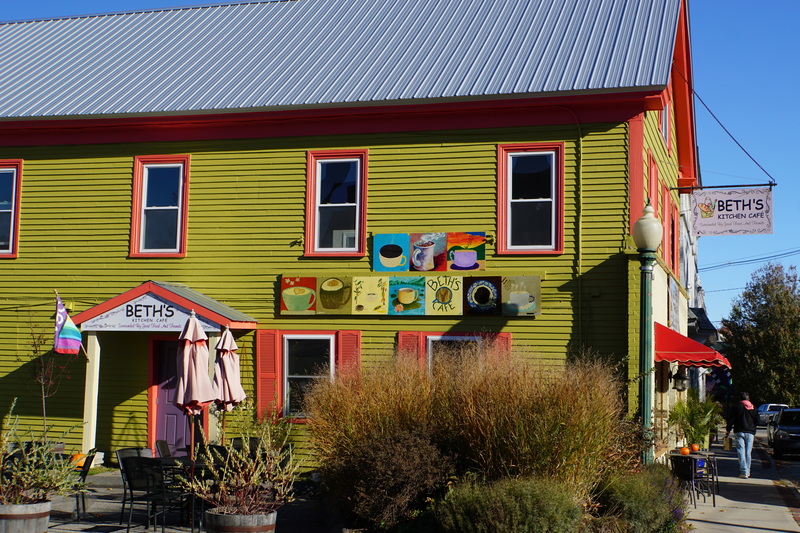 With thoughts of breakfast at “The Blueberry Muffin” rolling through our heads, we headed off. This was the fourth or fifth campground we’ve closed. I’m losing count. We wanted to visit Camping World and Hills RV. Hills to purchase a check valve, Camping World to update some of our “stuff” and perhaps get some Blue Def. For some reason we went to Camping World first and found both the Blue Def and a check valve. We even replenished our propane. The Camping Word in Conway is a no frills shop. They have a very complete selection of important functional parts for your RV. They are short on “frou frou” items. To me, it’s great one stop shopping. We Picked up a Hitch Hiker!! 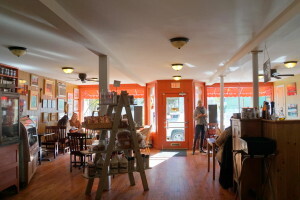 As we left, we asked Alison, the cashier, where we could get a good breakfast and she recommended Bea’s Cafe, Conway. They don’t have their own website so I’m directing you to TripAdvisor. We found Bea’s, right at the second light north of Camping World and had a great breakfast. I had Irish Eggs Benedict with hash browns, Ellen had one slice of French toast, eggs over easy and bacon. It was great. Bea’s does not accept credit cards! They’re a cash only establishment. We discussed where we should go next, knowing that we’ll have to be in Scarborough at 10 AM on Wednesday. We chose to drive to Portland and stay overnight close by. That way we can explore Portland and Scarborough on Tuesday before our appointment at Prime Mercedes. We took SR 113 to SR 302 and into Portland. SR 113 in New Hampshire had a number of single lane work zones complete with flag men. Where the road had been paved, it was superb. Then a bit later the new road ended and the old, “in need of repair” road appeared. It was no fun to drive. We kidded about it having a high crown, or very low shoulders, with pot-holes, bumps,, and divots. That didn’t last long. When we crossed into Maine, the road improved dramatically. The ponds and lakes that SR 302 runs by are gorgeous and huge. We stopped a few times to take in the view and fresh crisp (and frigid) air. 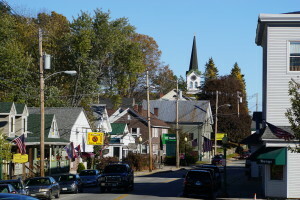 We drove through Bridgton, Maine and had to turn back and walk the town. It is a small town. As we walked onto the main street (302 runs right through the town), we met a police officer and started a conversation with him about Bridgton. 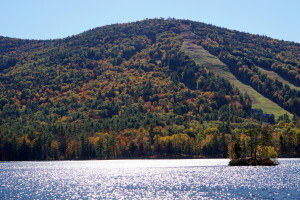 He had been on the job in Bridgton for 3 months. He explained where the interesting shops were, pointed out the theater and pub, which were closed, and walked with us for a while. He said like most of the people who lived in Bridgton, he was a Massachusetts transplant. He wore two stars on his epaulets. I didn’t ask his rank, but I’ll look it up. As we approached Portland, Ellen started looking for campgrounds. Every one close to Portland closed by Oct. 15th, some as early as September. Looking south, she saw more campgrounds around Old Orchard Beach and we headed south. Again, almost all the campgrounds showed they closed mid October. A phone call verified that they were closed. We turned into a Cabela’s parking lot to review our options. We had just stopped when a couple drove up. A fellow got out and got Ellen’s attention. 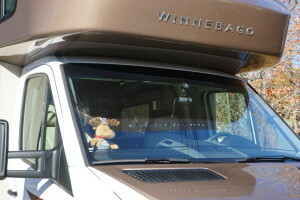 The fellow said he was very interested in our RV and wanted to know how we liked it. Ellen dropped into “Winnebago Saleswoman” and showed off Li’l Beast. We both enjoy talking up the advantages of our 24 foot RV and its layout. 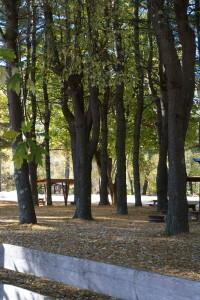 But two campgrounds were listed as closing at the end of October, one a KOA had good reviews and was “expensive”, the other an independent had poor reviews and was moderately expensive. Ellen called the KOA; no answer. We arrived to find “Closed for the Season” signs posted. OK, we backtracked to the not-so-good campground. 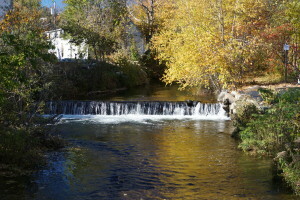 I turned off the highway and found a cement bridge over a creek confronting me. The bridge did not look secure to me and I backed away. We chose to walk up to where we thought the campground was, past a home on the left. As we headed up the road, a woman walked down to us. We asked her if there was a campground up the road. “Yes”, she said, and asked, “What are you driving”. We explained that we wanted an electric hookup and water if it was available. She said they had a water line in the men’s bathroom burst yesterday. That she was not sure what would be available. “Would you have an electric hookup?”, I asked. 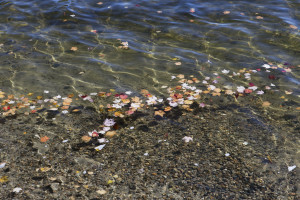 She said, “No.” Then while we stared blankly at each other, she said, “In fact, I’d rather not rent to you.” Truth is she felt uncomfortable as she preferred not to have anyone on campgrounds due to uncertainty of freezing temperatures. We were thinking the same thing and said,”That’s OK, we understand, No Problem”, turned around, and left. Our last solid campground disappeared in a puff of “we don’t want you”. Normally, I’d be insulted by a statement like that. In this case, I was happy she felt that way. There was one last possibility. Ellen had seen and Elk Lodge in the outskirts of Portland that listed electric hookups! We were not sure what we’d find, but off we went. About a mile up the road we saw a sign for Walmart. We stopped to ask if OK to park there and apparently not a problem as we noticed a couple of RVs and Trucks parked in the back of the lot. Now we had another backup if the Elk’s Lodge fizzled. About seven miles later, I drove past the Elk’s Lodge, U-turned (a recurring theme), and we drove in. 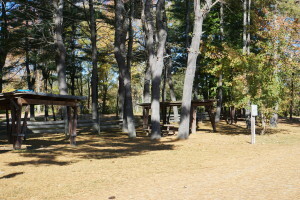 There are two parking lots one to the right of the lodge, the other to the left. There was nothing for us in the right lot, but there are 30 amp services in the lot to the left and they are live! We have eaten a crock pot dinner and had a piece one of two slices of apple pie we bought in Bridgton. The pie was very good. Both our antennas are live. We listened to The Voice, and are now watching Castle. 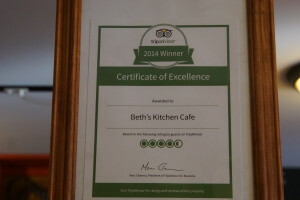 The pies at Beth’s Kitchen are very good. They’re not super sweet and have no gelatin in the filling. The art gallery, Gallery 302, featured painted wood sculptures that look life like and nothing like wood. I thought they were cast or carved stone. Various outdoor shops (REI, EMS, etc.) commission the artist for pieces for their stores. We spoke some with the gal at the counter. First about the cold and rain and snow. That led to talk of Mt. Washington being covered in snow this morning. She asked if we hiked to the top! She took her parents hiking on a ridge near Conway this past weekend with views of Mt Washington. Ellen here; We bought the apple pie at Beth’s Kitchen Cafe in Bridgton, which is a small cozy place especially with the sun streaming threw the windows. This is a casual breakfast and lunch scene. They make numerous baked goods including savory quiche and meat pies. 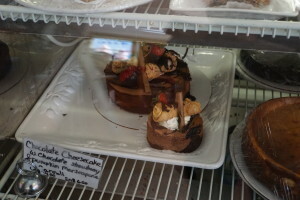 I I also noticed a chocolate cheesecake with chocolate strawberry and pumpkin marscapone cannoli. dessert. Luckily I was able to resist. Ron asked if they had a cherry pie, they did not, but we could order one for the next day. 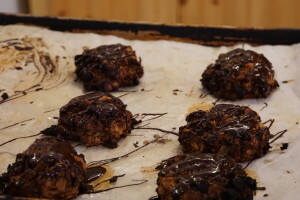 So if you are planning on driving through Bridgton and thinking cherry pie or other favorite, call for special order…. 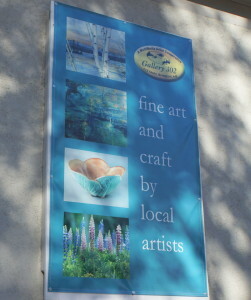 Prior to stopping at the cafe, we spent some time next door at an art gallery. 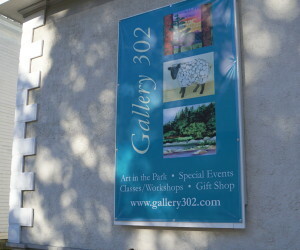 Gallery 302, an Artists Cooperative features the works of 60 or so locals artists. 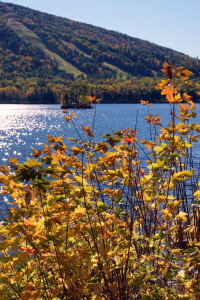 Much of the works are inspired by the gorgeous lakes area, landscapes and wildlife of Maine. 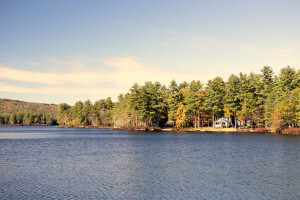 This entry was posted in Maine, RV Trips, To New England and tagged Bea's Cafe, Beth's Kitchen Cafe, Bridgton, Conway New Hampshire, Eastern Slope Campground, Fall camping in New England, Gallery 302, Maine, Maine Lakes on October 20, 2015 by up4air.